According to the American Academy of Pediatric Dentistry, your child should have their first dental checkup by his or her first birthday. Why so early? The oral hygiene techniques your child learns at this early age will last a lifetime, giving him or her the best possibility for excellent oral health. 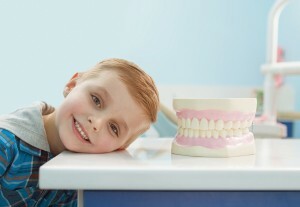 A positive experience at the Yuba City Dentistry Group can ensure that your child is a regular visitor into adulthood. Additionally, if the dentist spots any developmental problems or cavities, he or she has the possibility to address these immediately. What will your dentist look for on the first checkup? A number of things, actually. Tooth decay may begin early, even affecting babies and toddlers. If left untreated, childhood caries (tooth decay) could develop rapidly – possibly reaching the soft, inner section of the tooth (dentin) in around six months. In addition to checking for tooth decay, your child’s dentist will make sure the teeth and jaw are developing properly. If not, the dentist can work with you to develop the treatment plan that is best for your child. A number of treatments are available to save or repair children’s teeth or aid their development. Additionally, some treatments can even help prevent tooth decay from beginning. Topical Fluoride: Fluoride is a natural mineral that strengthens tooth enamel and increases its resistance to decay. For many children, the amount of fluoride provided in most toothpastes and in drinking water is sufficient. However, some children may benefit from a higher concentration of fluoride applied directly to the teeth by his or her dentist. Sealants: Your child’s teeth have small crevices, also known as “pits and fissures”, found on the chewing surfaces of the rear teeth. Dental sealants – plastic coatings that cover these crevices, prevent the tooth decay causing bacteria from collecting in these pits and fissures. Bonding: Active children are especially prone to chips and small fractures of the teeth. By using special bonding materials – plastic or glass resins that can be colored to match the teeth – your child’s dentist can treat these damaged areas, restoring teeth to full function and appearance. Root Canal Treatment: Baby teeth serve a vital purpose in guiding the permanent teeth that begin forming under your child’s gums at an early age. At times, root canal treatment may be required to save an injured or decayed baby tooth to prevent further problems in the future. Orthodontic Treatment: In most cases, a dentist can clearly identify definitive problems with tooth positioning and jaw growth by the time your child reaches the age of 7. Orthodontic treatments can be used to remedy these problems, preventing or simplifying more complex and expensive treatments that would be necessary as the child gets older. Should My Child Use a Mouthguard? If your child plays sports regularly, his or her dentist may recommend the use of a custom mouthguard. These protective devices can drastically reduce the chances of injury to the teeth; in fact, the American Dental Association states that an athlete is 60 times more likely to harm the teeth if not wearing a mouthguard! Using a model of your child’s teeth, the custom-fit mouthguard will provide the greatest protection possible. This small investment now can prevent major pain and expenses in the future.